What is the "diamond"? What's the difference between synthetic diamonds and diamond - Hwatien Enterprise CO.,LTD. 1, Glass: glass ground into a fake acrylic stone are easily distinguished because of its low refractive index, there is no kind of real diamonds flashing colored light, slightly experienced people see at a glance. This "diamond" is often used to compare cheap jewelry. 2, synthetic spinel: it lacks the diamond flashing colored lights, it is immersed in diiodomethane, its outline will be blurred. The real diamonds outline is very clear. 3, synthetic sapphire: colorless transparent synthetic sapphire and figure can also be used as a substitute for diamonds. 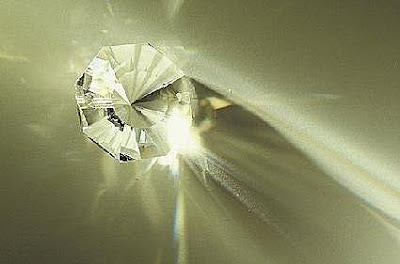 But it almost disappear in the "diiodomethane" rather dark edge of real diamonds, very clear. 4, crystal and topaz: transparent two natural mineral crystals, and diamonds after pondering similar, but lack the diamond bright color of fire. And they are "non-homogeneous body", while the diamond is "homogeneous body", with polariscope relatively easy to distinguish. 5, zircon: Before synthetic cubic zirconia appear, zircon is the best diamond substitute. Zircon has a strong birefringence, i.e., it has two refractive index, and the refractive index and the large difference between the two. Resulting a very special optical phenomenon, observed with a magnifying glass when pondering good zircon facet gem, it can be seen from its top surface and the bottom of the ridge there is a clear double shadow. While the diamond because it is "homogeneous body", no double image phenomenon. 6, cubic zirconia (ie "Soviet diamond"): This is the first of the former Soviet Union launched the best diamond substitute or bogus products, artificial compounds, no natural minerals. Because cubic zirconia in the refractive index, dispersion and other aspects of natural diamonds very close. But its low hardness (8.5) 1.6-1.7 times the specific gravity of the diamond, up to 5.6-6, and the thermal conductivity is much lower than diamond, it can still be used with the instrument to accurately distinguish the diamond. Now we finally understand the concept of "glass gems" of the bar, in addition to "synthetic diamonds" in the glass relatively easy to distinguish, the other "synthetic diamonds" is generally the most important thing is to look shiny. In natural light, brilliance of acrylic stone is always "diamond" imitations can not match. We recommend that, in the daily purchase, are not allowed to really draw the line, do not buy or guarantee certificate in professional testing organization with authority issued to buy.